A Google Spreadsheet engine for a Twitter bot. The .gs files in this repository are the underlying GAS code for the dev version. To use one of these spreadsheets, use “File -> Make a Copy…” to save it to your Google Drive. A step-by-step guide for the legacy version is available on my website. The basic setup steps for 0.5.x are included in the spreadsheet linked above, with a slightly more verbose version to follow below. Use the “infinite gmail” trick for your bot’s email address. This is the trick where you add “+something” to the name in your email. 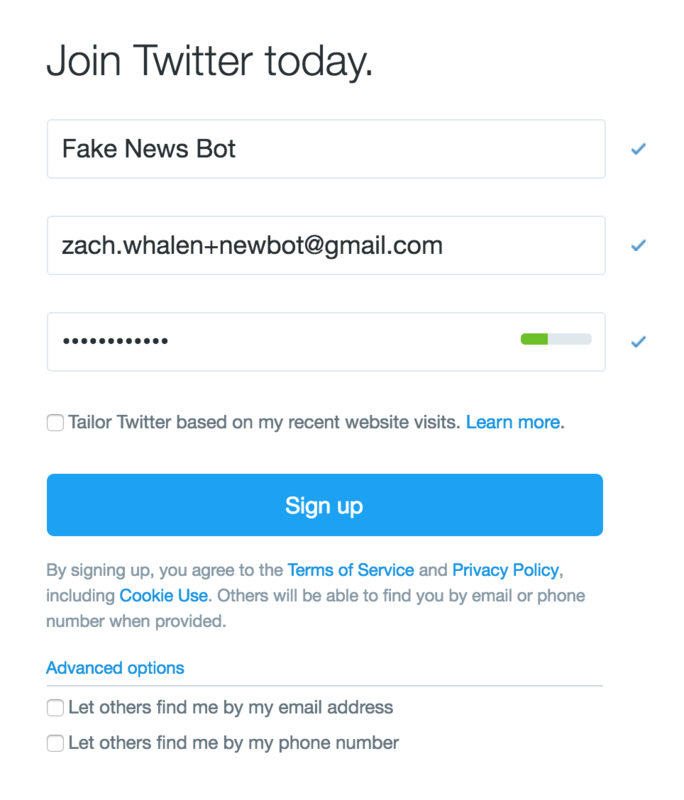 For example, my gmail address is “zach.whalen@gmail.com,” but I can also use something like “zach.whalen+myfakenewsbot@gmail.com” and it goes to the same inbox, which is convenient. Of course, if you want to really separate this bot from your real life, you can make a bespoke Gmail account. Do use a phone number. This will save you a step later, and you can always disconnect this number after the bot set up is complete. Since you can only have one Twitter account per phone number, text “STOP” to 40404 to disconnect whichever account is currently connected to your phone. Don’t follow anyone, and don’t follow the bot from your real account. Not until you’re ready for other people to find it. You can customize your bot’s profile now or later, but I always like to give my bots an avatar picture, a nice background, and an informative bio that explains the bot purpose while disclosing its botness.